We are one of the renowned organizations, involved in offering a wide gamut of Cricket Bails to our clients with the help talented professionals. Cricket kit bag, cricket ball, 4pc wickets, 1 pair bails, 1 pair batting gloves, 1 helment 1 AD & 2 leather ball. Riding on unfathomable volumes of industrial expertise, we are providing a broad array of Wicket Bails. We are one of the organizations, involved in offering a wide gamut of Cricket Bail to our clients with the help talented professionals. Bails – two crosspieces made of wood, placed on top of the stumps. 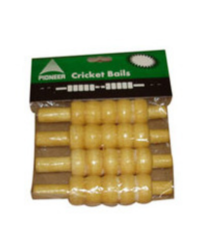 As a customer-focused organization, we are providing a wide array Cricket Bails. In addition to this, we are providing these products at very leading prices.